Celebration at Sissy’s – in the barn frame! For folks who have been following the Gunstock story, this past weekend Sissy had her first round of parties under the restored timber frame! In the photo, you can see tables set for a family reunion of 25. 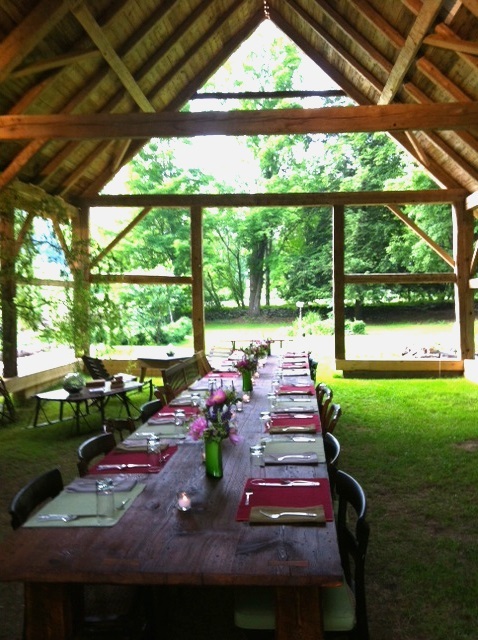 The two 12 foot tables, created out of vintage barn planks and timbers especially for this space, easily accommodated the large and happy gathering. During this event, I stopped by for my first view of the frame under lights. It was lovely to see the old barn frame full of new life. Several family members mentioned there was a magical feeling to the whole evening and we hope to be hosting many more such evenings under the timbers! This entry was posted in Frames in stock, Middletown Springs, Vermont and tagged American heritage, available barn frames, b, barn for sale, Green Mountain Timber Frames, Sissy's Kitchen, timber frame, vermont timber frames, vermont timberframe by Green Mountain Timber Frames. Bookmark the permalink.